Udupi/Kemmannu, July 17, 2017: How much do you know about your home and by home I mean the endless green surrounding that building made up of bricks? 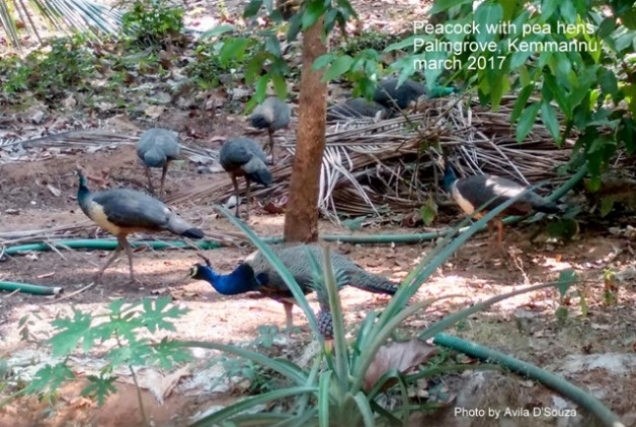 Kemmannu is not just home to us humans but to plenty of flora and fauna and we’re sure you don’t know half of them. But what’s the use of knowing all this you ask. Well other than learning about sheer awesomeness of nature, you can learn what plants are edible, how can they be used, how to grow or take care of them, impress the guest of yours by pointing at a bird or Butterfly and naming it. Bird watching is probably one of the least expensive and easy hobbies out there unless you shell out tons of money on high end binoculars. You don’t have to worry about those if you are just starting up though all you need to start up is patience. 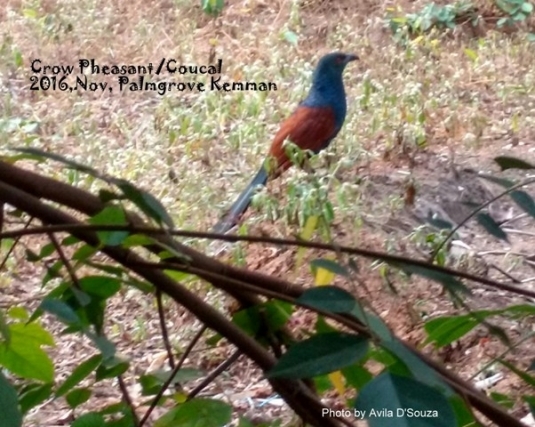 Well if you want to do bird watching binoculars are recommended but here in Kemmanu we have quite a few of those fearless birds which straight up come right next to you but if you’re determined then get a pair of binoculars. Taking pictures though that’s little hard if all you have is your phone camera by no means is it impossible so do your best. There are lots of local birds around here and we get visitors from all over the world so it’s not like you’ll run out of material any time soon. So if you like birds it’s not a bad idea to invest in a decent camera. Looking at birds and taking pictures is one thing identifying them is another. Identifying birds is part of the fun too. There are multiple ways to identify birds identifying birds by sight is just one of those ways. Another way is to do so by listening to their calls it is slightly harder but I’m pretty sure anyone in Kemmanu can identify that noisy and colourful national bird of ours by its call alone. Other ways include observing their nests and fallen feathers but those are kind of hard to do. It’s better for amateurs like us to stick to sight and hearing. 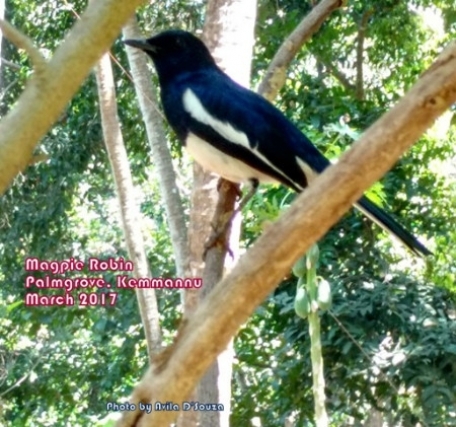 To help with identifying birds our state government has even made a catalogue listing the birds along with the pictures you can access the site through this link. I personally started bird watching with the help of a book by Salim Ali so I’m going to recommend getting a book written by him since he was pretty much the best ornithologist in India when he was alive but since his books are pretty old so if you are ready to spend a couple of minutes on the internet you’ll find a lot more resources to help you identify birds. This year is a pretty cool year to start bird watching it being Salim Ali’s thirtieth death anniversary so let’s have some fun bird watching in respect of the “Bird Man of India”. I am sure you will enjoy it if you try. 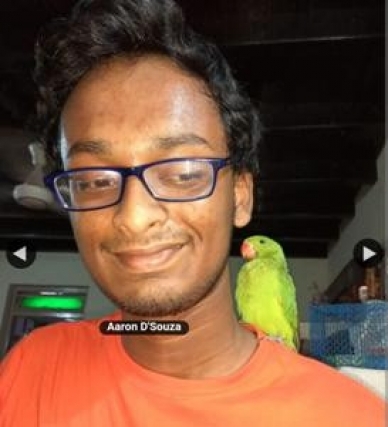 Aaron Ambrose D’Souza, is the 2nd son of Braan and Dr. Avila D’souza from Kemmannu, a 19 year old doing his 2nd year diploma in Civil engineering at TMA Pai, Manipal. His passion is bio-diversity. I really appreciate your zeal,it’s a wonderful hobby which is followed by good write up....Do explore more on these issues nd be focused,good luck Arron. It is refreshing to see youngsters like Aaron not only to have interest in nature, but also have the drive to write about it to influence others. 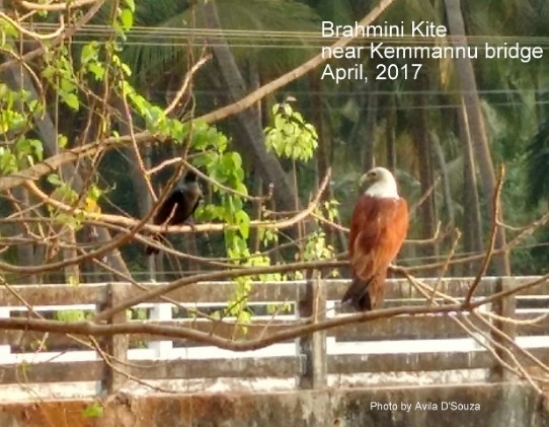 Thank for your support I’ll keep writing about various things related to the animal and plants in Kemmannu that I’m interested in as much as I can so that we can appreciate surroundings better and make a conscious effort in protecting it. Aaron Your passion for nature and zeal to unravel the secrets of flora and fauna was clearly evident since your childhood. Perceiving your hobby you can also incorporate it as a inspiration to Aspire and choose an unique career option which would set an bench mark for everyone to follow. Good article Aaron. You have a natural zest for bird watching. Keep writing. Keep up the good work. Dear Aaron,very nice article about the birds. I know you are deep into different birds and animals, their origin, biological name etc. 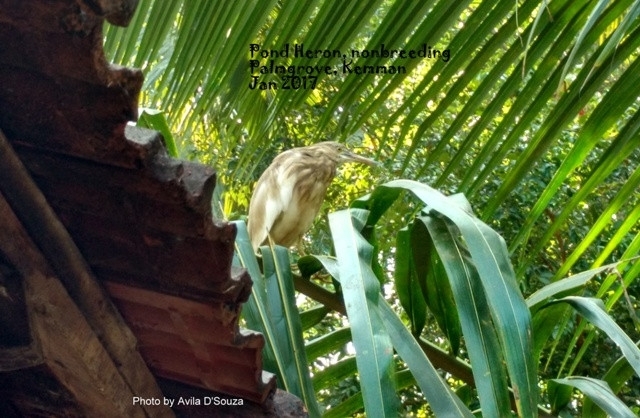 Kemmannu and other places in Udupi and Mangalore famous for capturing migrated birds, that was actually prompted Aaron to focus his hobby study on this subject. He is spending quality time of his on understanding complete information on birds and wild animals and doesn’t miss animal planet or National geographic TV episodes. Keep it up Aaron, sky is the limit for your achievement and future endeavor. Very Nice Article and picture Aron. Really itâ€™s our Grand Old country. It reminds me the song Country Road take me home to the place I belong. Wonderful article about nature.Keep the good work going.. looking forward to more articles. Nice Article Aaron. God Bless you. I am also very much fond of birds. Used to sit at Kuwait beach watching Flemingo’s. A very informative article.Well done Aaron..
Aaron you have done really very great job keep the good work in you, keep writing awesome articles and keep us updating about kemmannu . What a great article Aaron! you have invested a lot of time and energy into this great hobby! It’s really hard to find youngsters like you who take nature so seriously and take time to actually write about it. You have not only used your limited resources on this great hobby but you have educated others and you have set an example to others and specially inspired other youngsters! I am sure that your dad is a great motivator and was quite generous to help you out! 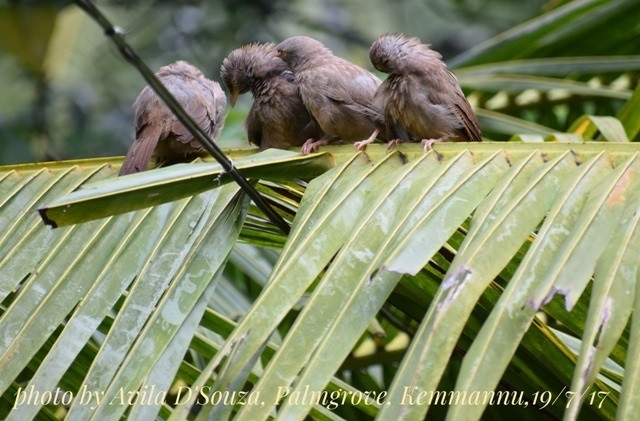 while most youngsters do bird watching, you have done it in a literal sense and kudos to you! Please keep up the good work and be a role model to other youngsters! Well written Aaron!! Feels like coming home soon! Nice Article Aaron, Please continue the passion and like to see more in future. All the best. Nice article. Keep it up Aaron. Spectacular!! 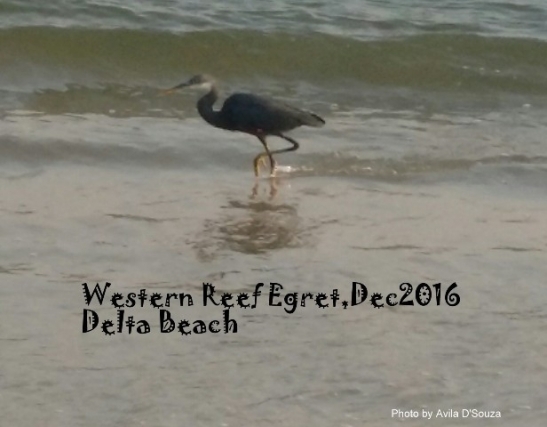 Great opportunity to see the lovely birds and their beautiful movements. You certainly have a great eye for beauty. Keep up the excellent work!! Aaron nice article well written and for someone who is looking for a new hobby Bird watching is the ultimate. You have articulated it well, as I stay in Goa and have a place in an island called Chorao close to Panaji which is next to Salim ali Bird sanctuary. I have seen many a migratory birds coming there. You article made me feel to go back to bird watching which I have not done for a long time. Nice article from Aaron,Unique interest and hobby amongst all of us.Keep going God bless you. Aaron, could u please write article on Kemmannu Pollution with some good pics and names of particular areas. Very nice Aaron. Keep it up. I know one day u will be assets to India. Use ur brains and shine like a mg star. I am proud of u beta. Keep going . good initial work don’t look back. Set an example for all average scorers. All great people are unique. God bless my Arron. I love u putha. 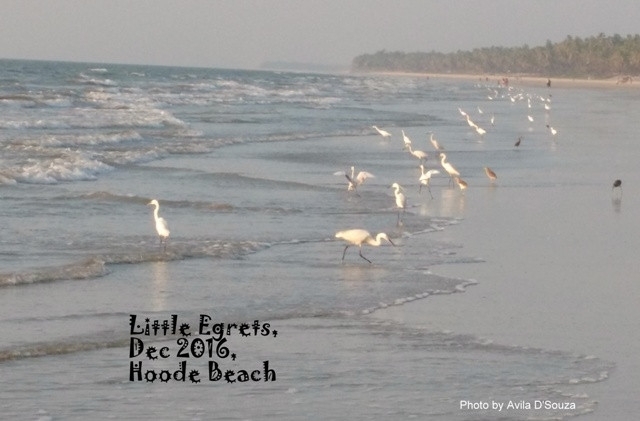 Next to the little egrets human birds in two piece swimming suits perhaps could not be photographed. Fine. Na na charbovna mhatharo. Bravo Aaron, bird watching is definitely my new hobby! For a change a refreshing article from Aaron, a change which in turn could change our attitude towards nature. We enjoy watching National Geographic but do and care little about our own backyard of flora and fauna. With a naturistc Father in Braan and a Bio Chemistry Mom like DR.Avila, we expect more such earthy articles from Aaron. A beginning as a reporter. I found the article was very informative and very discriptive. Congrats Aaron. Keep up the good mission you are venturing in. May God bless you. Very nice article Aron. Keep up your good hobbies, looking forward for more articles from you. Bravo! Aaron, Keep it up.You will be a writer one day. Very nicely depicted Aaron. Awesome job on birds. I am proud of you. Good one Aaron. Inspires more to move to Kemman. As a starter giving guidance as to how to go on with the passion of bird watching in a detailed description with minute expense is really worth it. Braan shared with me about your passion some time back when he was in Mumbai. Keep the good work up. Wish you all the best. Very interesting Article Aaron... Enjoyed. Nice to know about the Bird Man of India Salim Ali, nice tribute to him on his 30th death anniversary. Keep up the good work and wish you all the very best. Nice article Aaron, hats off to u. We would like more pics on Floura Fauna more info on our land we born.